So you know when you're constantly buying new makeup...like every week..I really need to stop doing that. But anyways when you do that other items that you once loved gets pushed to the back of your collection, leaving it to be forgotten about until you have a clear out..or you're on a spending ban. For me it's the spending ban option. So I decided to go through my makeup drawers and see what I could find and found 8 gems that I had forgotten all about. So now that I know I have them I've been making myself use at least 2 or 3 of them every time I do my makeup, because who doesn't love a challenge!? As we're now officially in Autumn it's time to break out every thing Berry and Burgundy. For me thats starting with the Maybelline Colour Tattoo in Metallic Pomegranate. This is such a gorgeous Burgundy shade and its absolutely perfect if you're looking for an easy smokey eye, because this is such a dark and dramatic colour you can literally just use this all over the eye, blend it out and apply as much as you want and bam. Dramatic smokey eye in less than three minutes. I forgot all about my MUA Undress Your Skin Highlighter in Pink Shimmer. This was my absolute favourite highlighter before I discovered the Sleek Solstice palette. It is the most gorgeous pale pink/peach shade and when it's on the skin, well you're going to blind some people. For a product with such a small price tag it definitely is one of my favourite highlighters. Although I did forget about it I'm so excited about using it again. Which I have actually been doing so the past few days and I've fallen in love with it all over again. 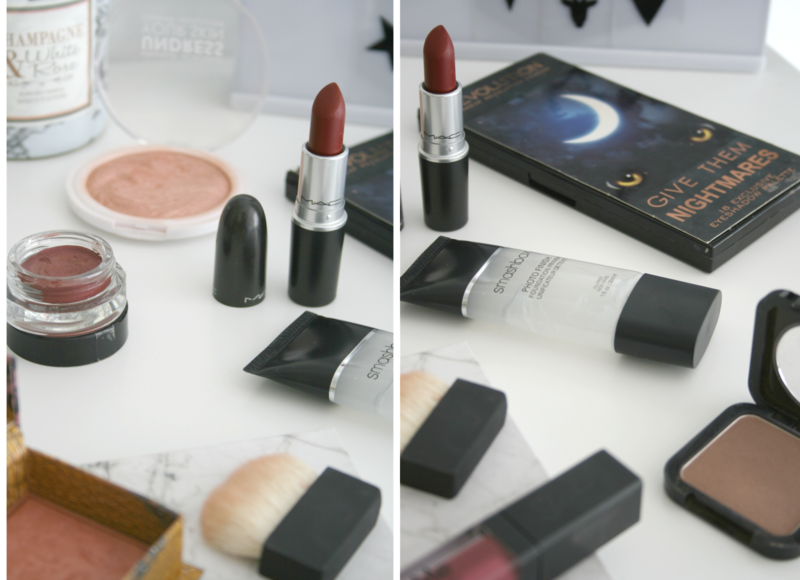 Who doesn't love a dramatic lip in Autumn!? How gorgeous is this Mac Hearts A Flame Matte Lipstick. It is the perfect dark matte red shade I've ever owned and it's definitely that perfect vampy shade. As it's a matte formula it also lasts forever before you have to top it up. As it is such a dark shade though I do have to use a lipliner before just to be on the safe side. However I cannot wait to start wearing this. 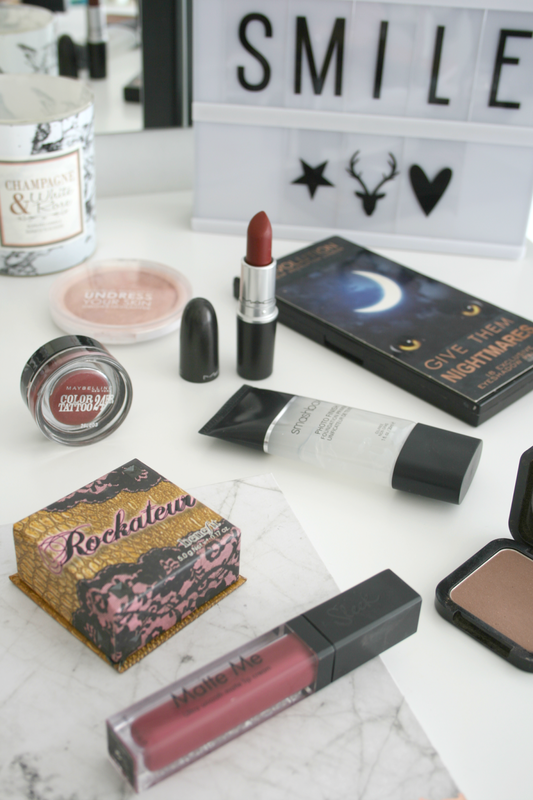 Basically just give me all the vampy makeup and let me rub it all over my face! During Summer I fell in love with the Smashbox Primer Water and it was all I used. Now I want to go back to my beloved Smashbox Photo Finish Primer. I used to absolutely swear by this and wouldn't use anything else. I find this really keeps your makeup in place and I used to recommend it to everyone! I honestly don't know how many tubes of this I went through but I definitely know it was a lot. Something that I don't really forget about but always break out at this time of year is the Makeup Revolution Give Them Nightmares Eyeshadow Palette. Consisting of Greens, Blues, Purples and Blacks this is the most perfect palette I've ever come across for the month of Halloween. Definitely suited for those who like to experiment, I forever use the Greens and Purples for when I'm feeling extra Halloween-ish to create an eye look inspired by the Wicked Witch. The quality of the shadows and pigment are brilliant and it's definitely a palette I'd recommend you check out. Although Kim K has said contouring is over, in my books it's far from it! I forgot all about the NYX Blush in Taupe and I'm now so excited about finding it again. Although made as a blush this is the absolute perfect shade for contouring if you have a Snow White completion. It's not too dark or orangey and has a grey undertone to it (nothing too crazy to make you look like a corpse). I've moved this right to the front of my bronzer area because I absolutely adore it. I use this with the Real Techniques Blush Brush and the pair together just work so well. Blush is something I totally give up on until Autumn rolls around. Benefit Rockateur is my go to blusher and my absolute favourite out of the few blushers I own. The gorgeous rose gold shade just wins everything, it also smells really nice. I love that this has to be built for full on colour pay off, I don't like crazy pigmented blushes so this one is perfect for me. Also the packaging is still my favourite, like I don't know how many years it's been but it's still adorable in my eyes. Definitely a blush worth checking out if you're not crazy on too much colour but just want a healthy looking glow. Finally a product I haven't really used. The Sleek Matte Me Lipcream ion Velvet Slipper. How perfect is this shade for Autumn!? 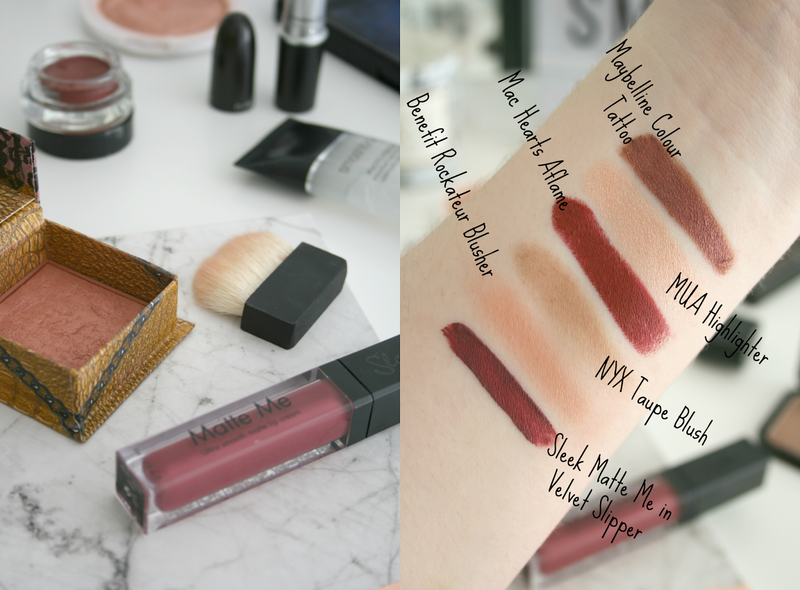 I know I know how typical another Berry toned shade but I just cannot help myself okay!? I haven't really tried this yet except for swatching it however I did love the formula and wore the shade Birthday Suit a lot before buying the Kylie Cosmetics Liquid Lipsticks. So that's all the makeup items I re-discovered in my collection and I'm so excited to get back into using them. While some of them I won't use everyday I'm at least trying to make myself use 2 of them every time I put on my makeup. I've also decided to put myself on a little spending ban in hopes that I might actually start getting through some of these products. Wish me luck! Have you re-discovered any old favourites in your collection? I think I am slightly in love with the colour of Velvet Slipper, its so pretty!! These products look great and sound great! The Sleek Liquid Lip shade looks amazing!